When you arrive to Benidorm, the first thing you will notice is it's massive scale, behind the boulevard there is a massive skyline of big holiday apartment buildings. Also the gay scene is quite large, there are about 30 gay places, and they are all located nearby each other in the Old Town. 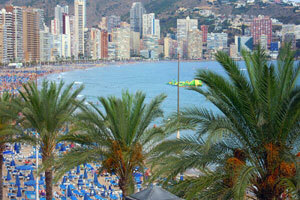 Benidorm is quite large, so make sure you book your hotel or apartment near walking distance of the Old Town (map). There you will find all gay bars, clubs and sauna all next to each other. Check our hotel page for hotels and apartments. Benidorm has an extensive gay night life scene. Almost all places are located very close to each other, in only a few streets in the Old Town. Many guys crawl from bar to bar. The majority of guys are from all parts of the UK. Several bars are British owned. Some terrace pubs are already busy from the afternoon with UK guys, but most of gay night life in Benidorm gets started at Spanish times, so late from about 23:00. There are about 30 gay places, here we list several to give you an idea what it is like. Some places are closed or are open limited outside the season.